A long, slow simmer in a spicy barbecue-chili sauce is all a beef top round steak needs to get tender, juicy and flavorful. 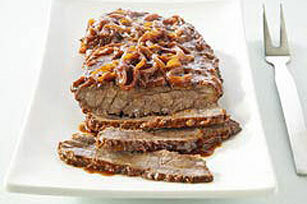 Cook steak in hot oil in large skillet on medium-high heat until browned on both sides. Add onions; cook until golden brown, stirring occasionally. Add steak sauce mixture to skillet. Bring to boil; cover. Simmer on medium-low heat 1-1/2 hours or until steak is tender.